If you're a regular reader, you know I'm a sucker for things hanging from the ceiling. It's an odd little fixation. I think it's an unobtrusive way to bring the feel of festivals, seasons and the full three dimensional outside world into our indoor play space. This time around, with my longing for warmth and sunshine and more color in our days, I invited Spring into our home with new dangling bits of pretend greenery in various corners of the play area. Back for St. Patrick's Day, Naiya and I had done a little wet on wet water color painting in many shades of green. (For more information on wet-on-wet water color painting click here.) This week, we took those now dry, heavy sheets of green water color paper, folded them at about every inch then (on that fold) cut out various leaf shapes. After hole punching at one end, we stuck two leaves together with a dab from a glue stick and tied them onto a length of gardening twine. After repeating this at varying intervals we had a collection of vines to stick to our ceiling. 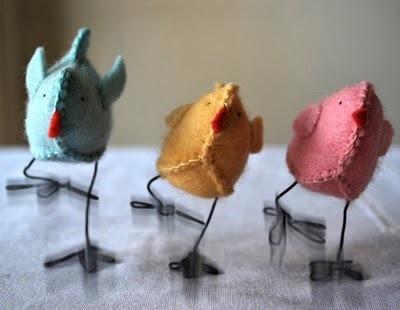 Myrtle & Eunice have a really clear, comprehensive tutorial with a pattern for these simple, adorable Easter Chicks (which can be made with or without legs). This is, by the way, my new favorite blog! Over at The Purl Bee, I found a how-to on these adorable Bunny Finger Puppets. Molly says you can make a set of five in one evening with time to spare. 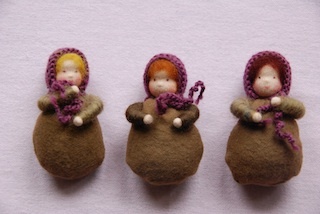 At Plain and Joyful Living there's a knitting pattern for these Simple Little Gnomes. Perfect for a Spring Nature Table and small enough to nestle in an egg. 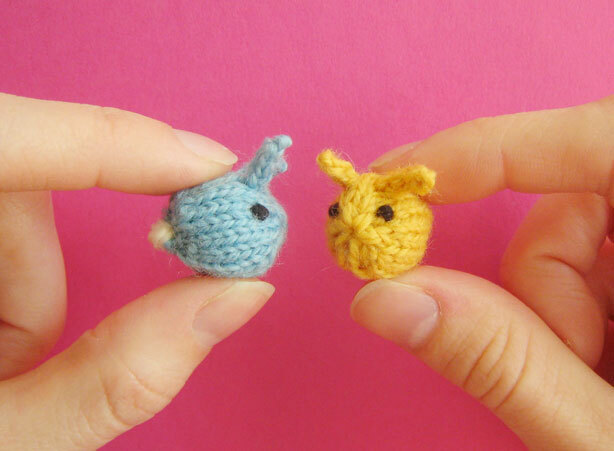 I don't knit, but I also found these Tiny Baby Bunnies from Mochimochi Land. If I had perfected that skill, these little gals would probably be underfoot everywhere in my house. 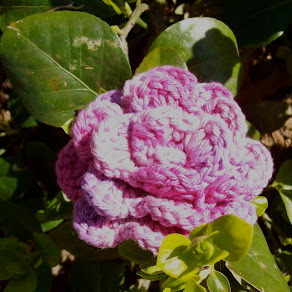 Since I do crochet, I might take a crack at some Crocheted Roses from The Philosopher's Wife. I especially like that done in a variety of colors, these can be displayed and played with for several seasons. If you can manage the translation, there's a tutorial at Poppenatelier Severine for these super sweet Root Children. For an English version, just hit the Google Translate button to the right of the instructions. Even without the translation though, the photographic guide is pretty clear (especially if you've ever made a Waldorf style doll). What tiny, egg-filler handmade crafts might you have to share? Inspired by Thomas Berger's Wax Whimises, Crafts and Candles for Families, Naiya and I recently embellished these beeswax candles using Decorating Wax from Stockmar. The Decorating Wax is very thin sheets of colored beeswax perfect for adorning candles of every season. Little hands can easily cut it with a dull knife or even with cookie cutters. Naiya couldn't get enough of this activity and asked if we could get more of the eggs. My favorites were those we rolled ourselves (like the one on the right) from Dyed Beeswax Sheets purchased at our favorite local Bee Supply Store. (It somehow seems much more amusing when its sung with the tune. When we've got a big tray full we offer them up to the chickens. It's not much of a battle there really. The chickens win every time. For Spring there are so many sweet butterfly crafts. This year we discovered this really easy folded version that can be made quickly by both adults and children. There are endless variations on this theme and all sorts of alternative materials and designs that could be used. We started with some crayon drawings we had laying around but one could just as easily use patterned scrap book paper, card stock or even pretty recycled magazine pages for the wings. In addition to the paper we needed scissors, some wire (I like copper), needle nosed pliers and beads (optional). Begin with a rectangular sheet of paper. Fold it in half length wise. Fold in the corners on each side. This can either be done so that the sides form points (as seen here) or have a flatter edge (depending on the wing shape desired). If using a thicker card stock, one may wish to cut off these folded corners. For thinner paper, leave as is. Fan fold from the center out on each side. Repeat with a second rectangle that is about two thirds the size of the first. Bend a length of wire around the two pieces, binding them together with a twist at the top. Slide a bead over both wires (if desired) and curl the antennae by wrapping around needle nosed pliers or a pencil. We thought these could be hung from a Seasonal Tree, used on a Nature Table or even placed inside of Easter eggs. This year for our schools annual fundraising auction, I helped organize the creation of this delightful Felted Spring Wall Hanging. We wanted both parents and children to be able to contribute to the project and so worked it out in stages using various felting methods and materials. The children in the kindergarten class range from four to six years old and therefore have limited skills and attentions spans but untold wells of creativity. The basic image was inspired by their daily art work and, as you'll see, their contributions were what made so much of the piece original and interesting. While the children were participating in the classroom, I didn't want to be too distracting by snapping a bunch of photos (also, the light in there is quite low and terrible for picture taking) so, this first part of the photo exposition is a smaller reproduction of our project that I did alone at home. We began by using duct tape to piece together many scraps of recycled bubble wrap to make two 5' x 3' sheets with which to felt. The tape was stuck onto the smooth side of the bubble wrap at each of the seams. After a suitable size, colors and desired image were chosen, one sheet of the wrap was laid bubble side face up on a water resistant surface to receive the layers of wool roving. The first layer established the size and outline of the piece (taking into account that it would shrink by about 20%). On top of the first layer, a second layer (in the same or different color, depending on the effect desired) was laid with the fibers in the opposite direction. In the classroom, the children wandered over three or four at a time to assist the parents and teachers in this step. They were surprisingly adept at criss-crossing each successive layer and especially enjoyed laying down the wool where the two colors met. A third, and fourth layer were then added, each perpendicular to the prior layer until the piece was three or four inches thick. For this scene, we worked it out so the final layer of "grass" was vertical and the final layer of "sky" horizontal. The children in class were getting excited by this time and the sky wisps especially were not so exactly applied. There were swirls and curves that, in the end, made it even more surprisingly beautiful! One person commented that it had a sort of Van Gogh "Starry Night" quality. 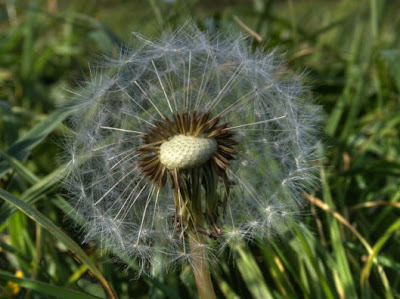 Such is the magic that the children's so-called imperfect contribution brought! We then laid down some yarn and wool to represent sun and flowers (a common theme in the daily art of the children). On top of this whole picture we gently placed a sheet of tulle (window screen or other types of netting can also be used). This helped hold the fibers in place while little and big hands started the felting process. Using a warm water and soap solution (about 2 cups of water and 2 teaspoons of dish soap) we sprinkled the entire project until it was all damp but not soaking. We then compacted the wool by gently pressing down with our hands, adding water to noticeably dry portions until the sheet was evenly flat. When the fibers felt fairly stable, we began to pat and rub across the tulle in various directions, lifting it occasionally to keep the wool from felting into it. Basically, what is happening in this process is that the movement in various directions and the friction of the hands is binding together the microscopically barbed fibers of wool into a solid mass. When it seemed the fibers and yarn were firmly held in place by our initial rubbing, we removed the tulle and placed the second sheet of bubble wrap over the project. We wet the top of the plastic with the soap/water solution so that our hands could glide smoothly over the surface and continued stroking in various directions and circular patterns. The two layers of bubble wrap pushed against both sides of the wool act like hundreds of additional tiny fingers that help further knit the fibers together. The children got a bit wet but seemed to love this portion of our craft. Since our project was quite large, we had many hands rubbing for at least 45 minutes before we moved on to our next step. We would have liked to have had the children help with this next stage also but ran out of time in the classroom. Instead, at home, I rolled the project (still inside the two layers of bubble wrap) around a pool noodle (which is just a big 2" diameter length of round firm foam...one can used a rolled up towel if a noodle is not available) and tied it firmly in place with some stretchy bits of scrap fleece. I rolled this cylinder back and forth for another 30 or 40 minutes, occasionally untying and unrolling to check on the solidity of the fabric. The felting/fulling process was complete when the individual fibers could not be separated from the mat when pulled up between pinched fingers. 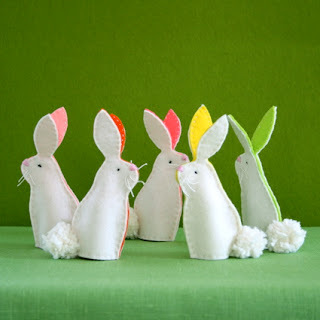 For kids this age, needle felting isn't really an appropriate activity, so a group of parents then took the beautiful creations and needled them onto the dried felted base. In the end, the combination of wet and dry felting gave the project a soft and breezy, three-dimensional quality. We thought it would make a great wall hanging in a child's room or even a festive seasonal backdrop for a Spring Waldorf Nature Table.